The remote northern end of the island of Moloka'i offers a modern view of an ancient culture. 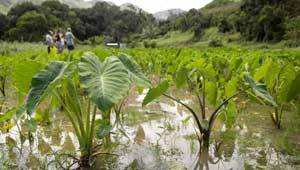 Local residents began restoring lo'i (terraces) and 'auwai (canals) in 1997, and reintroduced taro to Halawa Valley, which had been grown by the very same system for several hundred years up until the middle of this century. In 1998 and 1999, TPL, working with local community leaders and the Maui Open Space Trust, acquired key parcels of land with private donor funding, and granted the parcels to the land trust for community stewardship. The Halawa Valley program functions as an outdoor classroom, bringing at-risk youth from the neighboring islands to the valley for education, recreation, and connection to a rich cultural history.